Well done to all our athletes that took part in the Olympics in Limerick last week. The events took place between 9th-13th June. We had 20 athletes representing Sunbeam in three disciplines including 5-a-side football, table tennis and athletics. They came back with ten gold, five silver, six bronze and six ribbons. 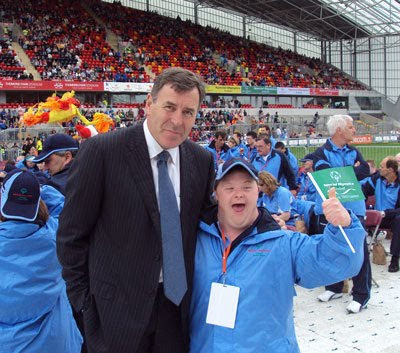 Pictured above is Ian with Packie Bonner lending his support to the event. A most wonderful achievement for him plus his visit with team members to meet with the President Mrs. Mary McAleese and her husband Dr.Martin McAleese ,following their arrival home .